The Fujinon TF25DA-8 is a 25mm F/2.2 to F/16 lens designed for a 1/3 Format 3CCD Camera with a C-Mount. 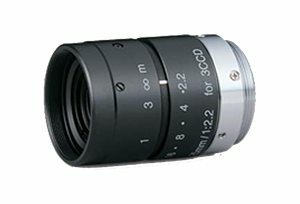 Features include a minimum working distance of 0.2 meters and a M25.5×0.5mm threaded lens barrel for filters. Original specifications posted on http://fujifilmusa.com Visit Fujifilm's website for more information.